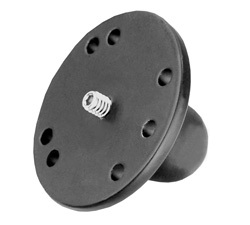 The RAM-B-224-1-366U is a strong hold suction cup mount with a 3.25 inch diameter suction cup base, marine grade aluminum standard sized length arm, 1/4"-20 male camera adapter plate. Click on Technical Specs above to view dimensions. Includes RAP-B-366U diamond adapter plate with 1 inch rubber ball. Included Arm: RAM-B-201U black powder coated marine grade aluminum standard sized length arm for 1 inch balls. Included Camera Adapter: RAP-B-366U 1 inch diameter ball and 1/4"-20 male thread. This thread connects to female threads found on many camera and video cameras. Below are popular accessories compatible with the RAM-B-166 series. Click on the links below for more detailed information. Alternative Suction Cup Mount Options: Click here to see alternative suction cup mounts such as cup holder, mirror mounts and other suction cup mounts from light to heavy duty. 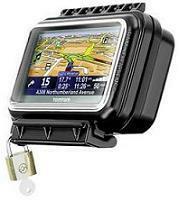 Cradle / Holders: Select a holder for Apple, cell phones, GPS systems and other electronic devices by clicking here. All are compatible with the RAM-B-166 series and attach to the optional RAM-B-238U diamond plate. 1 inch ball adapters attach to the RAM-B-201 series arm. RAM-B-202AU 2.5 inch round plate with 1/4"-20 aluminum stud. Click here to see all 1 inch ball adapters. Waterproof Aqua Boxes: Waterproof Aqua Boxes with soft touch flex lens allows the touch screen of electronic devices such as iPhone or GPS devices to remain operational. Knock-out hole allows cables to be run through the back of the aqua box. The electronic device sits in the aqua box using included foam inserts. The RAM-HOL-xxxx cradle is not needed to secure the electronic device in the aqua box. Padlock not included. Can be mounted in the vertical or horizontal position. Attaches directly to the optional RAM-B-202U. Includes foam insert and 1 inch rubber ball. RAM-B-132SU can be purchased as a complete kit. RAM-B-132BU cup holder only. Attaches directly to the RAM-B-201U arm.